The thought of eating alone sits on the soul in a manner of ways. To some, it is a comfort. It may be a quiet time for mother to enjoy her own sublime cuisine, spent away from chicken fingers with ketchup. The gourmand may spend secret alone time devouring a guilty orange pleasure of microwave mac and cheese. For many, perhaps a Wall Street stock broker or a lonely mid-thirties career gal, the idea of eating alone means taking oneself out to lunch, spending money on good food and good wine. Others still find the idea repulsive; a schoolchild with few friends may spend as little time as possible eating lunch, not wishing to face seclusion. The solitary intake of food can be soothing, overwhelming, enjoyable, or even irritating. But no matter how one reacts to the event, dining alone is a simple fact of life. We have all, at one time or another, faced this necessity and reacted in a whole manner of ways. As for me, dining alone is a bit of all of these things. On a cool night, all alone in my tiny apartment, I’m curled up in a blanket with a grilled PB&J, watching movies on the coach. A much needed day off is usually spent treating myself, sometimes to shopping or a movie, but almost always with a nice meal. Dressing up in fancy clothes and taking myself out for a date always makes me smile after long work weeks. And after a late night, chips, homemade salsa, and a beer is a great way to relax me down. I enjoy the quite time spent sitting at a table dining alone watching others around me, taking in the scene, and the lack of energy needed to eat tacos in front of the TV. Cooking for myself is usually simple but delicious, pasta or rice with salt, pepper, butter, fresh tomatoes. Sometimes a glass of white wine. When plans with friends fall through though, an unexpected dinner alone can turn into frustration and depression. A dinner date gone awry can make dinner for one downright miserable. Being alone in the kitchen indeed has it’s ups and downs. The book is a terrific read. Jenni Ferrari-Alder has brought together some powerful, insightfully humorous and touching essays on a subject that truly touches everyone. 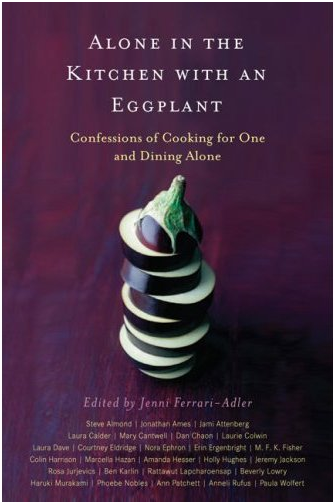 The essays connect with the reader and with each other, in many ways glorifying the art of eating alone, but also showcases it’s ability to bring out tears. Reading one, you may laugh out loud, and in the next few pages be flooded with sadness. Overall it is a book full of emotion, the very core of eating alone, and one that will, at the very least make you appreciate your last meal, solitary or not. great review! You should make sure to post i on amazon as well, that way people there will have a way to find your site here.